Meet BRCK, "a backup generator for the Internet"
Ushahidi is a team of programmers and mappers who are constantly on the move. From cafes in San Francisco, to the iHub in Nairobi, to working in crisis situations like the Haiti earthquake. The same goes for our community, a global network of activists, organizers, NGO workers, government personnel, and so many more dealing with these same problems. Being constantly handicapped with spotty internet access has led us to realize that the way the entire world is connecting to the web is changing. We no longer only get online via desktops in our office. We have multiple, mobile devices which have, for many of us, become the primary means of connecting. So Ushahidi set out to redesign the modem for the changing way we all connect to the web. We thought it was about time the modem got a makeover. The equipment used to connect in Kenya, India, Costa Rica, or the rest of the developing world is the same as that used in New York and London, even though the conditions are completely different. The modems used around the world were designed for the USA and European markets; they assume ubiquitous electricity connection and years of fiber and DSL infrastructure. But this is not the case for the three billion people who are expected to get online in the next five years. At Ushahidi, we face this problem all the time. We realized that what we really needed was a smart, rugged device that could connect to the internet any way it could, hop from one network to another, create a hotspot for multiple devices, while plugged in or running on battery power. Enter BRCK: The easiest, most reliable way to connect to the Internet, anywhere in the world. It works when the electricity goes out and it works when the Internet goes down. It is portable and easy to set up. It supports up to 20 devices, with WiFi powerful enough to cover multiple rooms. Ushahidi’s mission is to improve the way information flows in the world and the BRCK is a natural extension of this. We build tools that help people collect and share data, information, and stories. In many ways the BRCK is the vertical integration of the data collection market. The modem is the gateway between our devices and the wide world of the internet, but it is has been left ignored blinking in the corner, looking much the same it did 10 years ago. As a software company, we are seeing that some of the most innovative products out in the world today are when the agile, intelligent aspects of software and data are brought to an outdated piece of hardware. Square revolutionizing the credit card swiper, for instance. 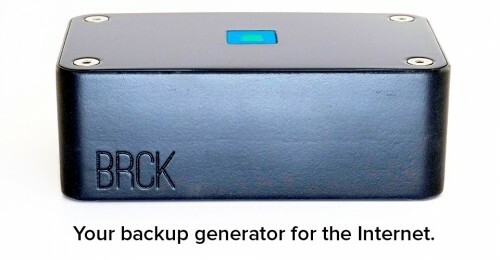 The BRCK is a software infused device, operating seamlessly with the BRCK Cloud, our website that you can access from anywhere to check how network connections and electricity are performing on your device and a portal to install new services like VPN, Dropbox, or any other app that you might create. It also syncs your BRCK with current data from cellular providers in your country. It can also hold 16GB of memory and you can sync your data directly to your Dropbox, other connected devices, or other applications. Furthermore, a BRCK device that is deployed in rural Indonesia can be fully managed from an office in London -- or vice versa. Of course, the success of our company is due simply to the software we've released over the past five years but to all of the creative, important, and inspirational ways our community has found new and exciting applications for it, from putting out fires to monitoring new democracies to fixing potholes. So it's important to us that the BRCK and BRCK Cloud be extensible so anyone can develop apps for it. The BRCK has a documented API for apps and hardware expansion capabilities that allow it to be used to connect with field hardware: monitoring security sensors, communicating with other electronic devices -- including other BRCKs. Securely managed entirely from the BRCK Cloud, the expansion ports can be programmed to periodically relay values from analog sensors or to provide an immediate notification when a monitored switch is activated. With the ability to manage an unlimited number of BRCK devices from the same Cloud interface, the BRCK can serve to enable enterprises both big and small with remote connectivity and field data collection from a single, unified portal with your data in the cloud. "If it works in Africa, it will work anywhere.” This has been one of Ushahidi’s favorite sayings, and it remains true for our new product. The emergence of a hardware product from an African company marks a phase-change point for tech invention. The BRCK shows that great ideas can come from anywhere, that innovation comes from solving real problems with constrained resources. Change happens at the frontier. We have started a Kickstarter Campaign to move the BRCK from its current prototype phase into a fully produced, field-ready product. We need your help to achieve this goal of taking the prototype to production. We have raised just over $40,000 USD in the first 72 hours but are still a ways off from our goal. Please spread the word and help make this truly remarkable story about an African tech company building a hardware product that the whole world could use a reality. For more information, photos, and specs, please visit BRCK's microsite at brck.com.